Tuesday, August 7 Missouri voters will decide whether our state will adopt an anti-labor, so-called “Right to Work” (RTW) law. Peaceworks urges our members and supporters to turn out in large numbers and vote “No” on Proposition A. ● Peaceworks is also concerned about social and economic justice. Strong unions are a bulwark against growing economic inequality. In fact, the trend towards lower real wages for workers has tracked closely with union busting and anti-union policies adopted starting during the Reagan administration. States with RTW laws consistently have lower wages and fewer workplace protections. ● Justice is an essential ingredient for peace, both on the international stage and domestically. If we hope to live in a peaceful world in the decades to come, we better get on the right side of history and start pursuing economic democracy and a participatory economy, rather than moving further along the road to oligarchy. ● The ability to organize strong unions capable of standing up to management and negotiating fair wages, benefits and rights for workers affects more than just those who are in unions. Strong labor correlates with higher wages in general and higher state minimum wages. States that have such laws also tend to have higher quality and better funded public education and more investments in infrastructure which benefit the population at large. RTW states, on the other hand, tend to adopt an agenda of cutting spending to the bone. Tax cuts for the well-heeled are paid for by cuts in programs that protect and provide for the least among us and diminish the quality of life for the population at large. ● The challenges of our time require building a broad-based alliance of all groups on the left. Peace and sustainability advocates need to ally ourselves with groups working intersectionally to advance gender justice, civil rights and liberties, and an economy that works for all of us. We must do this while challenging xenophobia and other toxic isms that divide our society with fear-based, us-and-them thinking and the scapegoating that comes with it. A Popular Front is needed to counter the neo-fascist direction in which our society has been moving. Organized labor challenging the grip of Wall St. and transnational capital is a necessary component of this movement, and it is essential right now, with labor on the chopping block, to stand united in solidarity. Right to Work laws have their roots in the late 1940s as push-back on the advances that labor had made under the Wagner Act, a key component of FDR’s New Deal. The 1947 Taft-Hartley Act opened the doors for adoption of RTW on a state-by-state basis. For many years it was almost exclusively states in the former confederacy—that is the most backward states with the least organized labor force—that adopted RTW laws. In more recent times there has been a push, largely funded by powerful rightwing figures including the Koch brothers, to enact RTW in other states, particularly in the Midwest Rustbelt where labor has lost much of its strength due to deindustrialization and out-sourcing of production. 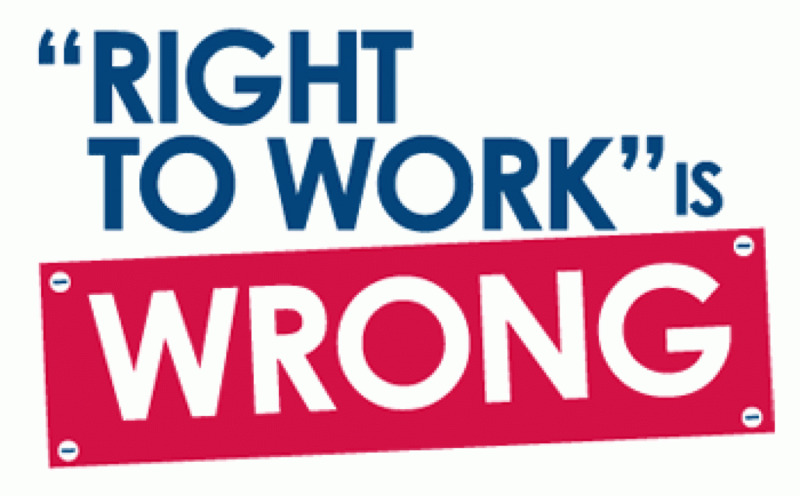 Much of the support for RTW has come from the extreme rightwing, including the Olin Foundation, and there is much crossover between RTW leadership and far-right groups like the John Birch Society. 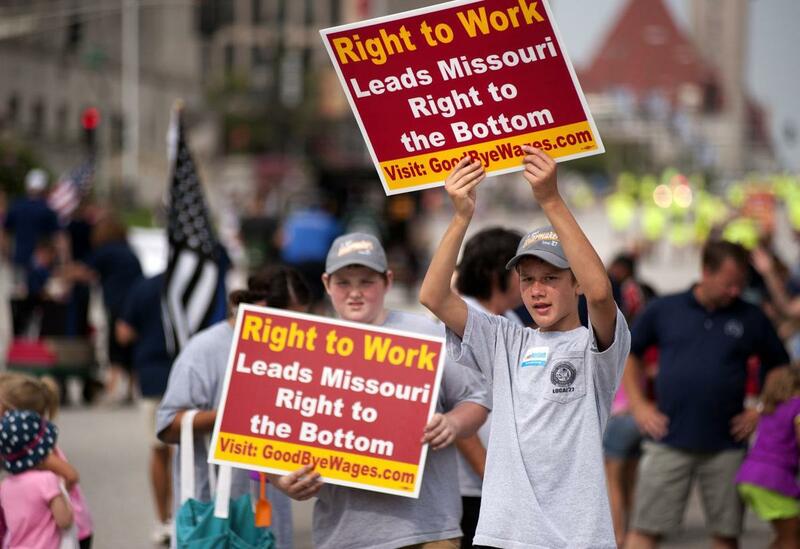 In Missouri, where voters had turned back a RTW ballot issue in 1978, the renewed push for RTW was embraced by the GOP-controlled legislature, but blocked by Gov. Jay Nixon. When Eric Greitens took office in 2017 RTW advocates quickly passed, and the Governor signed a RTW law. Labor, however, took to the streets with a referendum petition to block the law from taking effect. Hundreds of thousands of Missourians signed the petition, and this then referred the issue to the voters. The vote on RTW, Proposition A, was originally expected to be held in November 2018 at the time of the general election. But the legislature moved the vote to August 7, the date of the primary, which usually draws a much smaller turnout, tilted towards older and more conservative voters. This was a transparent move to put a thumb on the scale and pass RTW. The answer to this one is pretty simple. First of all, plan to vote “No!” on Prop. A. Then do everything you can to get friends, family, neighbors, co-workers, co-parishioners, etc. to understand what’s at stake and urge them to turn out and vote “No!” on August 7. Note, those who will be away on election day, or who are incapacitated can vote absentee. Details HERE. Deadlines apply. Click HERE for the form to request an absentee ballot by mail. Besides this, the No on Prop A campaign is in need of volunteers. There is both canvassing and phonebanking to be done, as well as other tasks. If you have a few hours to spare between now and August 7, the campaign would welcome your active participation. You can contact the local campaign coordinator, Joe Moore, by calling him at 732-948-5718. Learn more about the issue via the We Are Missouri website or Facebook page. For general background on the RTW issue click HERE. P.S. We have heard some people question whether unions are really a progressive force, and wonder if they are not corrupt or at least obsolete. Our response is that the labor movement is not perfect, and we don’t always see eye-to-eye on all issues, but let’s not throw the baby out with the bathwater. If some politicians are corrupt or embrace positions we disagree with, this is not a reason to abandon the electoral system of governance and embrace a one-party state or a military dictatorship. Likewise, unions are needed, in general operate in the interests of the workers they represent, and, as democratic institutions hold the potential for reform from within. To have them stand down, as RTW would do, would only empower corporate interests at the expense of these workers and all of us. Let us instead unite to defeat RTW and also support democratic, rank-and-file movements within unions. Note: Peaceworks is a 501.c.3 educational non-profit. We do not endorse, support or oppose candidates for office. We are allowed to spend a limited portion of our budget on supporting or opposing legislation, including ballot issues.